Cats are frisky and inquisitive animals. 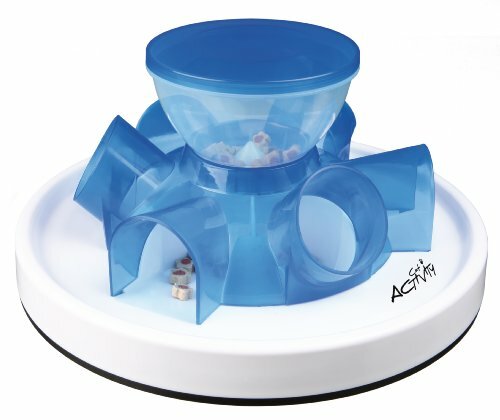 Channel their energy and curiosity into something positive with Trixie’s Tunnel Feeder for Cats. Simply fill the center container with your pet’s favorite small treats or dry food, replace the lid and let the games begin. Their rewards tumble down into six different tunnels where your feline can poke, scoop, jab and nibble away. You can also adjust the level of output to regulate how quickly treats/food are released, so it can also be used as a daily feeder. We’ve also included an instructional booklet with tips and tricks to stimulate your cat’s sense of curiosity through play. Dishwasher safe. One year warranty. Measures 11 x 6 Inch.